I'd like to start by stating the obvious: I am in no way, shape, or form a licensed professional. All of my skincare knowledge come from years of excessive research in the form of blogs, podcasts, YouTube, magazines and good 'ol trial and error. I'm the first to admit, skincare is no joke. Between essences, toners, serums, retinols, oils, cleansers, moisturizers and all that comes in between, it can get super confusing, super fast. And that's not even brand specific! Add in Keihls vs. Drunk Elephant vs. Olay vs. Origins and you could end up in fetal position in the skincare aisle of Sephora. 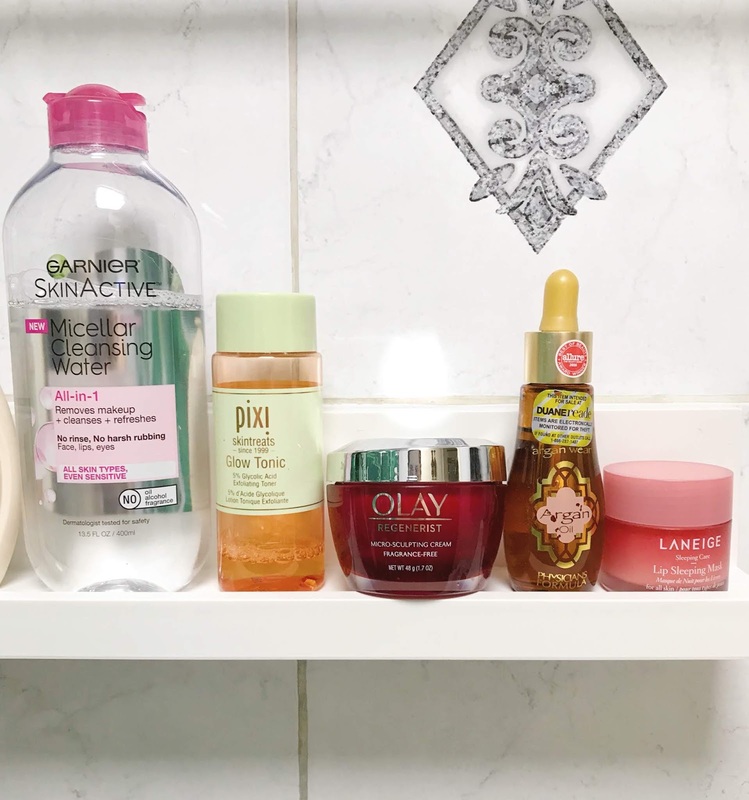 I thought I would walk you through my skincare routine and share some facts and tips I've learned along the way that you may find helpful as you either start to build your own or refine a routine you already have. Again, I feel the need to re-state that I am not an expert and am merely sharing what I've come across in my own research and what has worked for me. Before I start, I'd like to point out my #1 tip when looking to delve further into the skincare world: get comfortable with your skin. Take time to pay attention to it. Look at your skin in the morning when you wake up, throughout the day, after you take off your makeup. Do you get shiny by the afternoon? Does your foundation fade away? Do you have dry patches? Is your skin red? Do you get breakouts on your chin? What about your T zone? Have you noticed wrinkles forming? Do you have dark circles? What about puffy under eyes? Skincare products are not one size fits all and its important to know what you're looking to "fix", what you're looking to prevent and what does or does not work for you. For me, I would describe my skin as sensitive and oily and look for my skincare products to minimize redness in my cheeks, reduce that one pesky forehead wrinkle and smooth out the overall texture of my skin. 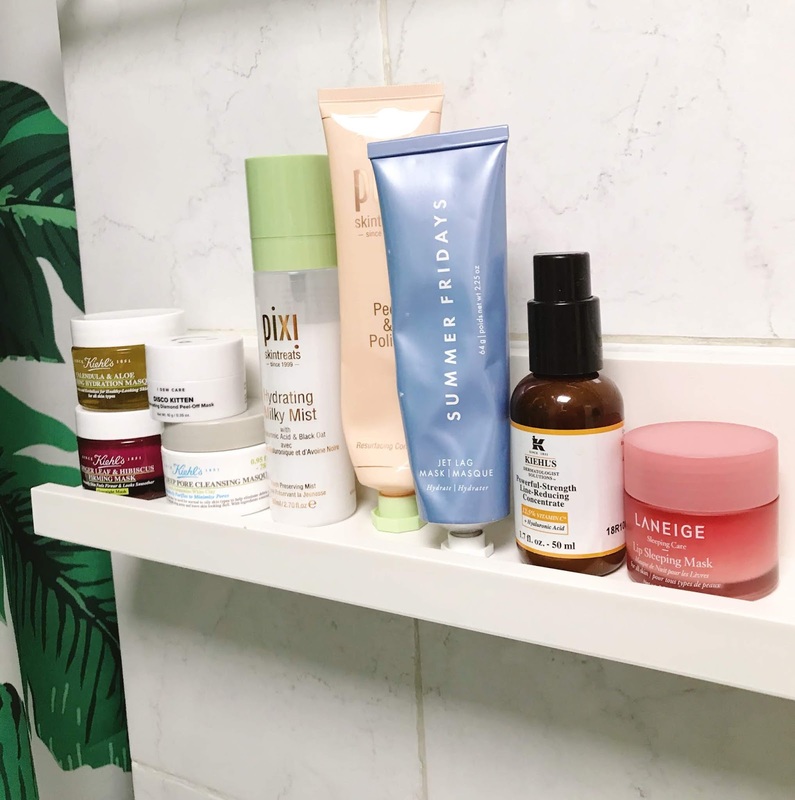 Once you've pinpointed your skincare concerns, it gets much easier to navigate the individual products and find a skincare routine that will work for you. I also feel the need to state that you do not need a medicine cabinet full of high end lotions and potions. Yes, there are steps that can be worth the investment, but you don't need to splurge on a full routine at Sephora or Bloomingdale in order to age like Cindy Crawford. As I walk you through my routine, I'll be sure to highlight what products I've found success with as well as some I've heard great things about that may be out of my price range. 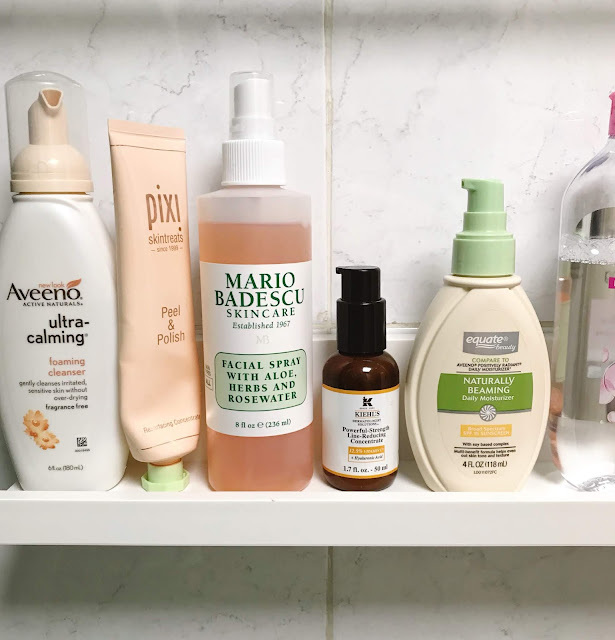 I will also preface with the overall knowledge that you should layer your skincare products in order of thickness; start thin and work your way up. Now, lets get on with it! I don't tend to wash my face with a cleanser every morning. Unless I've just worked out or haven't washed my face in a couple days (which usually only following days I didn't put any makeup on), I tend to just splash some water on my face and call it a day. I mostly do this so I don't strip my skin, but depending on your skincare needs, this could be a personal preference. On the days I do use a cleanser, I tend to go for any of the garden variety drugstore brands. I'm a huge fan of Aveeno products (or the Walmart/Target generic knockoff), since they're made for sensitive skin but I've also had great success with the Simple brand for the same reasons. 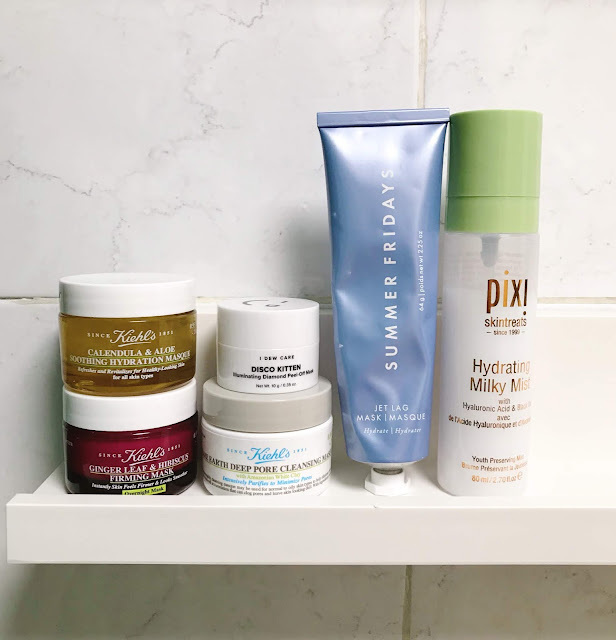 On the high end side of things, I've tried the First Aid Beauty and the Origins Checks and Balances cleansers and if I were to splurge, those would be my go-to product. I also do not use an exfoliate every day, nor would I recommend you do so. I recently discovered the Pixi Peel and Polish mask this year and love it for the day's I think my skins texture is a bit rough. For me that's about once or twice a week. The instructions only call for it to sit on your face for a minute or two so its convenient to apply it while I brush my teeth in the morning, but I've also used it in the evening if you'd rather go that route. Its important to note the difference between a physical exfoliate (the little beads you're running over your skin) and a chemical exfoliate. This product is a mix of both, but is more so a physical exfoliate. I don't currently use a toner, but depending on your skincare needs, you may find this step very beneficial. Where a toner is the last step in your cleansing routine, an Essense would be the first step in your skincare routine. I do not currently use an Essense because the only one I'm familiar with is the SKII Facial Treatment Essense and at $179 a pop, I just can't justify it for my 29-year-old skin. But if its in your price range, I've heard nothing but stellar reviews. Since I have concerns revolving around redness, I love the Mario Badescu rose water spray. You can find it at Urban Outfitters and Ulta for $5-$12, depending on the size, making it a very affordable option. I've also tried the Garnier rose water spray as well as one I found at Trader Joe's. Do I think it makes a noticeable difference in my skin? No. But it smells nice and perhaps there is a placebo effect. I could not be a bigger advocate for Vitamin C serums. I tried the Kiehl's Powerful Strength Line Reducing Concentrate this year and am now obsessed. My skin has never been glowier and I've even noticed the giant forehead wrinkle I've developed reduce in appearance. This is also the most expensive product I own. I recently bought the Mad Hippie Vitamin C oil during a Black Friday sale and look forward to comparing the two. The Ordinary also has crazy affordable options but if I'm being honest, I've been a bit nervous to pull the trigger since there are no less than 6 different Vitamin C products on their site. I apply this after my facial mist and try to let it sink in for a few minutes before applying my moisturizer. I started by using this in the evening, but I'd like to start using a Vitamin A serum in the evenings, so I moved this step to the morning. I've used the same Aveeno (or drugstore knockoff) for years. Its lightweight, absorbs quickly and is affordable. I don't think its necessary to invest in a morning moisturizer, but that is totally up to you and your preference. I don't currently have a separate SPF that I use every day since I use a moisturizer with SPF 15 and a tinted moisturizer or BB Cream with SPF 30+. I have heard that you should use separate products for SPF and not buy skincare or makeup products with it built in, so moving into next year, I'd like to invest in this Supergoop SPF. Either way, YOU NEED TO BE USING SPF EVERY SINGLE DAY. The first time I got lash extensions, I started using micellar water as my main form of cleansing at night (since you can't get the lashes wet, meaning I couldn't splash my face with water) and weirdly saw a huge difference in my skin. While the Garnier and Simple versions are a great drugstore dupe to the industry known Bioderma, I actually prefer the L'Oreal version with a red top. It takes a few cotton pads, but I remove both eye and face makeup with this. I will add, I have tried many a makeup removing wipe and 1) don't think they get all your makeup off the way micellar water does and 2) they tug on my skin too much or irritate my eyes. While micellar water is great, it is not a cleanser. You should remove your makeup first (with either a makeup wipe, micellar water, cleaning balm, etc) and then follow with a gentle cleanser. If you're someone who like one-step products, something like Liz Earle's Cleanse and Polish is fantastic. I don't exfoliate 2x a day, but if I didn't use my Peel & Polish in the morning, I consider using Pixi Glow Tonic at night after I cleanse. Overall, either day or night, I exfoliate 2-3x a week. After you cleanse your skin, you want to start your evening skincare routine. Serum's are the thinnest of all the products, so you want to start here. I have done extensive research on Estee Lauder's Advanced Night Repair and Kiehl's Midnight Recovery Concentrate but they're both super pricey so I haven't pulled the trigger quite yet. If you have more mature skin, you may want to consider investing. They both get stellar reviews and are more so "all-in-one" products that are more digestible to more notice skincare users (such as myself). If you're more interested in specific products, you may be interested in Vitamin C, Vitamin A or Retinol. All of these products are super important and can make the greatest difference to your skin over time. They can be an investment, but companies like The Ordinary have revolutionized the market. As I mentioned before, I'm interested in testing out more from this company and will certainly report back if there's any interest. As far as my own personal skincare, I used to use my Kiehl's Powerful Strength Line Reducing Concentrate in the evening, but switched it to the morning so I could use Mad Hippie Vitamin A serum in the evening. Same as it daytime moisturizers, you don't need to use a crazy expensive evening moisturizer. Serum and Retinol are more important to your skincare routine and sit closer to the skin, therefore you should invest there instead. I have been using Olay Regenerist Micro-Sculpting Cream in the evenings and so far I enjoy it. Its thick enough that I feel my skin is hydrated but doesn't irritate my sensitive skin. I've also used night creams from Aveeno and Simple and have loved them both. I used to apply oil prior to my moisturizer, but have since learned you should apply an oil as the last step in your skincare routine to "lock in" all the products. I've always loved Josie Maran Argan Oil, but its a bit on the pricey side. I've been testing the Physicians Formula Argan Oil from the drugstore and I think it works great. If you think you need more moisture, you can always mix some oil in with your moisturizer in the morning. Don't think that if your skin is oily, you shouldn't use an oil. Oil production and hydration are two very different skin situations. If your lips get very chapped like mine, you may want to consider a lip mask. I've heard great things about the Bite Agave Lip Mask but I decided to try out the Laneige Lip Sleeping Mask and so far so good! I don't use it every night but its definitely helping my chapped lip situation. Firstly, there are 3,409 different types of masks on the market: Korean sheet masks, clay masks, firming masks, etc. To make this easier, I'll just list out some of the masks I'm using currently and enjoying. I tend to use a clay (not charcoal - because there is a difference) mask about 1x a week to clean out all the gunk from my pores. Right now I'm using the Kiehl's Rate Earth Deep Pore Cleansing Mask, but that's only because I love the brand and Sephora had a mask kit during the holiday's for 20% off. I don't know that I notice a huge difference between a Kiehl's clay mask and the L'Oreal clay masks I had been using prior, so use your discretion. For hydration, the Summer Friday's Jet Lag Mask can't be beat. It's been all over the internet for about a year and the hype isn't far off. I also love the Kiehl's Ginger Leaf Hibiscus Firming Mask. Both are overnight masks and I love the idea of a bonus night of weekly hydration. I've also tried the I Dew Care Disco Kitten Mask and was surprised that it actually peeled off in one piece. I'm a big fan of facial sprays, but I understand they're not for everyone. I feel like the Caudalie Beauty Elixir is the OG facial mist, but many more affordable brands have come to market with options in recent years. I've been using the Pixi Hydrating Milky Mist for a couple months when my skin feels tight or for a refresh during the day, but I also love to bring it when I travel for an added boost during flights. Olay also released facial mists a couple months ago and I'm dying to test one out next. Lastly, as I mentioned earlier, I use a rose water spray every morning and have been for a few years. There are some other things I'd like to mention to close out this post. You should always apply your products in an upward and outward motion. The skin under the eyes is very thin and sensitive and you should use your ring finger to apply any eye cream, as its the most delicate. Dark circles are unfortunately more genetic than environmental and are caused by a thinning of the skin under the eyes, which in turn makes the blood vessels more noticeable. On the other hand, if your under eyes tend to be puffy, caffeine is known to be a very effective ingredient. Make sure you are always applying your moisturizer to your neck, clavicle and the back of your hands. Those areas are frequently overlooked and are the first to show your true age. Stop touching your face throughout the day. Your hands are a breading ground for germs and you don't want that on your face. Listen to your mother and stop picking your pimples. You will get a scar and it will be expensive and improbable that you will get rid of them. What are your ride or die skincare products?